According to Rosa Faulkner Yancey ("Lynchburg and It's Neighbors" Richmond, J W Fergusson, 1935 p 330) Charles Yancey, the immediate ancestor of the Yancey Family in Lynchburg" came to Virginia about the year 1674 with his wife, who was the granddaughter of Alexander Leighton, the famous Scotch Divine, whose persecution was one of the greatest scandals of the reign of Charles I. She was also a niece of Robert Leighton, another famous churchman, who was Bishop of Dublin and later Archbishop of Glasgow. 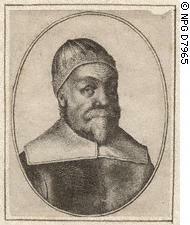 Alexander Leighton (1568-1649) was a physician and divine and was born in Scotland. The Dictionary of National Biography states that he was descended from an ancient family possessed of the estate of Ulysham near Montrose. He was outspoken in his opposition to the Roman Papacy and published a book, "Sion's Plea", against Roman Catholicism in 1628 in Holland. He was tried for this by the Star Chamber and in June 1630 was sentenced to pay a fine of 10,000 pounds, to have both nostrils slit, to have both ears cut off, and to have his face branded with the letters "S.S." for "Sower of Sedition". Only a part of this sentence, however, was carried out and the Long Parliament released him from prison in 1640, cancelled his fine, and paid him 6000 pounds for his suffering. In 1642 he was appointed Keeper of Lambeth House, which had been converted into a prison. He died in 1649. Alexander Leighton had four sons and daughters: James, Robert, Elisha, Caleb, Elizabeth and Sapphira. Only Robert and Elisha and the daughter survived to maturity. He was twice married, his second wife being the daughter of Sir. William Musgrave of Cumberland. 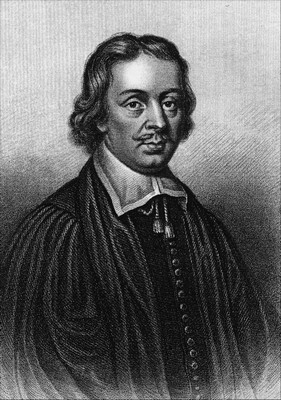 Robert Leighton (1611-1684), the elder surviving son of Alexander and his first wife, was noted for his Christian piety, his humility and gentleness, and his devotion to his calling. Although he had strong Presbyterian leanings, he allowed himself to be named First Bishop of Dunblane and later ArchBishop of Glasgow by Charles II in order to help preserve harmony and unity in Scotland. 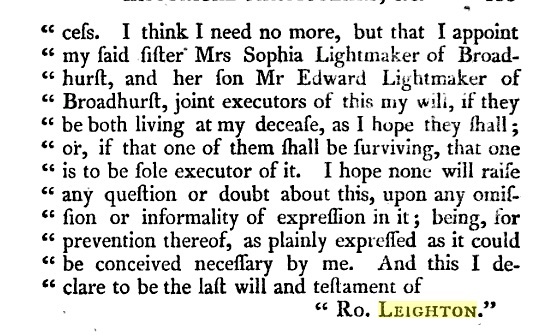 Robert Leighton never married, but references to his mother and sisters appear in a letter he wrote to his brother-in-law Edward Lightmaker of London: "My mother writes to me and presses my coming up. I know not yet if that can be. But I intend, God willing, so soon as I can conveniently . . . Remember my love to my sisters. The Lord be with you, and lead you in his ways". 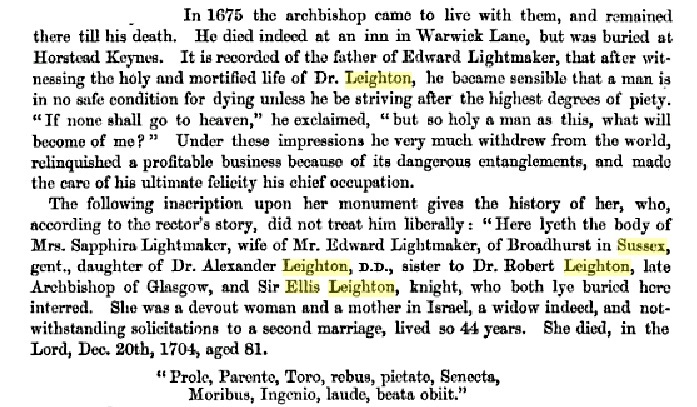 Bishop Leighton's sister, according to a biography ("The Life of Arhbishop Leighton", New York, American Tract Society, n.d. p. 53) was married "to a gentleman of fortune and character, Edward Lightmaker, Esq. of Broadhurst, in Sussex. Mrs. Lightmaker was now a widow, and lived with her son, in the family mansion. Thither Leighton was invited to retire  and spend the remainder of his days. His sister's spirit was congenial with his own, and young Lightmaker was a most dutiful son and respectful nephew. 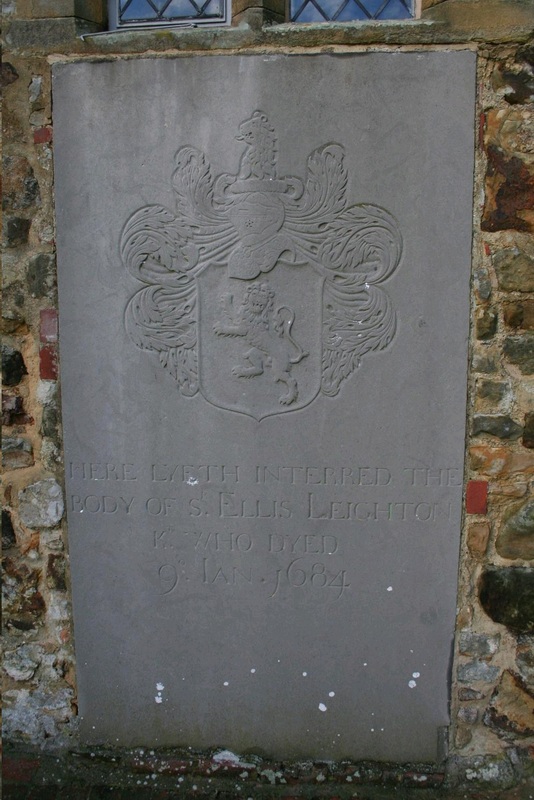 In all the sources studied so far on the family of Alexander Leighton, only one granddaughter, Mary the daughter of Sir Ellis Leighton, has been mentioned. 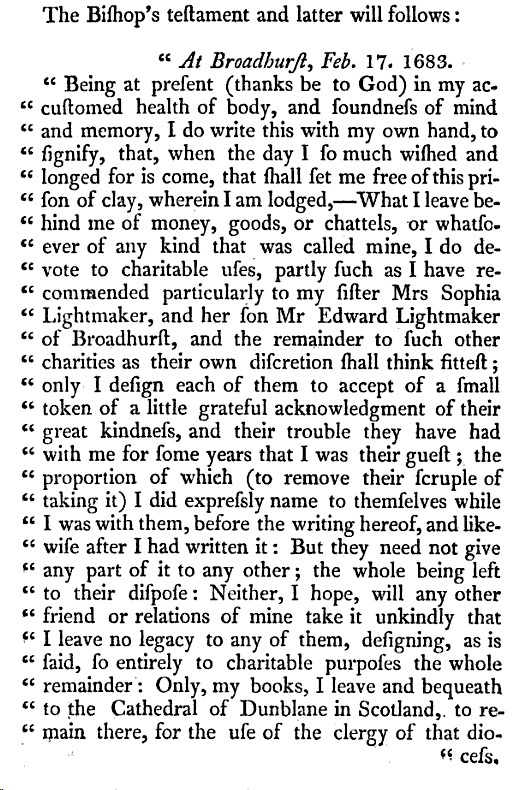 It would appear that one of Alexander's daughters never married and lived with her sister, Mrs. Edward Lightfoot, and only a son of Mrs, Lightmaker is mentioned. 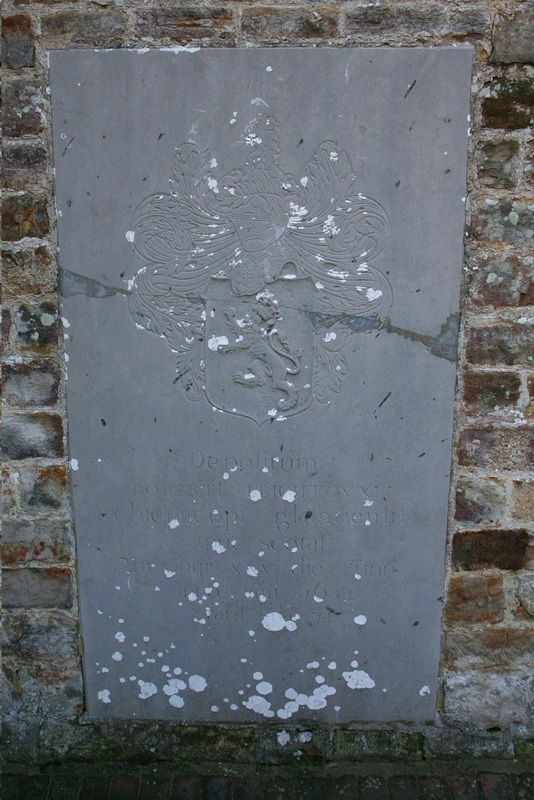 Further research may show whether there were any other granddaughters of Alexander Leighton who may have married Charles Yancey and came to the Colony of Virginia with him in 1674. It is interesting to note that the secretary to Sir William Berkeley, Governor of the Colony of Virginia, was Thomas Ludwell, who wrote correspondence for Sir William to his brother John, Lord Berkeley of Stratton. Thus two Yanceys, Robert Leighton Yancey, a son of Capt. Charles Yancey of Louisa County, Va. and Ludwell Yancey, son of John and Mary Layton Yancey of Culpeper County, were given names of families associated with the Berkeleys. See also notes on "Lynchburg and its Neighbors" By Rosa F. Yancey.